Come visit the Mini City with a Big Future! 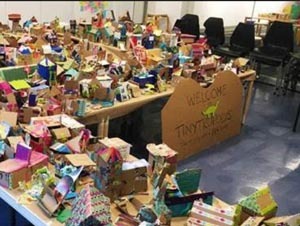 Join us as we design, build, and explore a mini city constructed completely out of cardboard and creativity. Enjoy this program and more at the all-NEW Discovery Museum! In our new, 16,000sf building we’ve re-created the best hands-on STEAM exhibits from our original two museums—for little kids, big kids, and their grownups—and added many exciting new ones, including water, air, making/tinkering, and more!